The Federal Snow Sampler is a professional grade snow sampler based on USFS design criteria to measures snow depth and water content to determine snow density. The sampler is made with 1 5/8" (4.13 cm) ID anodized aluminum material. The sampler can be specified in english or metric units with the standard USFS length in 30" long sections and the metric in 0.83 meter long sections. The tubes are precision hand machined to a very tolerance for accurate water equivalent measurements. 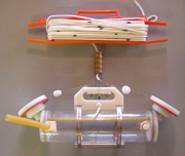 A sensitive spring balance is graduated in either equivalent inches or centimeters of water. The standard sets can be ordered with up to eight sections and includes a 3 oz, 16 tooth cutter typically used for sampling snow packs up to 30 feet (9 meters) deep. For deeper sampling or snow packs with layers of heavy ice, the thicker walled McCall sampler with 6 oz cutter is recommended. Also available is the Metric Prairie Snow Sampler with alloy tube, hardened steel cutter and screw-in T-handles. 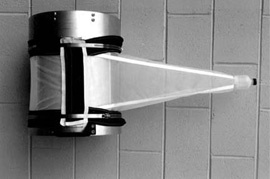 Based on the Environment Canada ESC 30 design, it is 1.2 meters long with a 6 cm internal diameter and is available with a spring scale and cradle. Each gauge section is accurately graduated into centimeters with each decimeter numbered and finished with a special porcelain enamel to ensure easy reading and to resist rust or discoloration. The metric gauge is one meter long, 8 cm wide, and is provided with grommeted holes for fastening. Gauges for any elevation may be assembled by using separate number plates consisting of a blue numeral on a 5.08 cm x 7.62 cm white porcelain enameled iron plate. 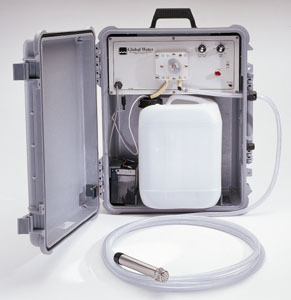 This composite sampler is designed for industrial discharge, sewer, river, and stream monitoring applications. It consists of a rugged, rain-proof, lockable enclosure, 2-gallon polyethylene sample bottle, peristaltic sampling pump, logic timer/controller, and rechargeable gel cell battery. Also provided is a 15' nylon reinforced 1/4" ID polyethylene flexible sample pickup hose with intake strainer, and battery charger. The sample bottle is equipped with a float switch that automatically turns off the sampler pump if the bottle becomes full. The user can adjust the desired sample size from 25 ml to 600 ml, and sample internal from 5 minutes to 4 hours. This free-flushing bottle is ideal for physical (temperature), chemical (dissolved gasses, nutrients) and biological (photo-zooplankton) sampling in shallow to very deep water. Also, this nonmetallic sample containment system can be used for trace metal sampling. Closure of the bottle is by means of a messenger from the surface releasing the tension on a latex band and thus pulling the two stoppers firmly into place. The tough clear polycarbonate cylinder enables previewing before draining and also permits mounting a thermometer inside. Multiple samplers on a single wire can be deployed for serial ("in-series") collection of water at various depths. A horizontal version, very similar in construction and operation to the vertical bottle, is available for sampling near the bottom or in the vicinity of thermoclines or chemoclines. The Van Dorn Bottles are also available in PVC and come in many sizes complete with brass messenger, 100 ft line and carrying case. 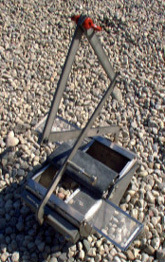 Surber samplers are designed for sampling riffle areas in streams and rivers up to a depth of about 18". It consists of two folding stainless steel frames set at right angles to each other. The horizontal frame encloses an area of 12" x 12" and marks out the limits of the sampling area. Attached to the vertical frame is a net to catch the invertebrates as they are dislodged from the substrate. The net is approximately two feet in length and is made of tough, rot-resistant 500 micron (35 mesh per inch) Nitex monofilament net. A base height extension may also be used when the horizontal frame must penetrate into the actual stream bed itself. The surber stream bottom sampler folds flat for easy storage and comes complete with a wooden carrying case. Replacement Nitex nets and samplers with other micron net sizes are available. Similar to a Surber Sampler but suitable for gravel and cobble bottoms, the Hess Sampler consists of a circular aluminum frame that is pushed into the substrate. It has two strong reversible handles for forcibly pushing and rotating the cylinder into stream bottoms. Both ends of the cylinder can be used for sediment penetration. The sampler penetrates 3 - 6" (75 - 150 mm). Once in place, the substrate is stirred up, and organisms are washed into the collecting bag by the current flowing through the mesh covered opening. Hess Samplers include a cylindrical aluminum net frame (36 cm diameter x 46 cm height), and a heavy duty Nitex net, 243µm, 363µm, 600µm, 800µm or 1000µm with sewn-in poly-bottle, cod end or net. The inflow screening is attached to the frame with Velcro and is removable. The Wisconsin Plankton Net is a popular and versatile plankton sampler. The main design feature is the anterior reducing cone which makes it more efficient than a standard conical net. The Wisconsin net is used only for vertical sampling tows. The sampler consists of three major parts: an anterior reducing cone, a posterior conical filtering net, as well as a collection bucket. It measures 30" long with a 5" diameter mouth opening. The net is 7" in diameter where the filter net meets the reducing cone. It is constructed with stainless steel net frames, brass bridle and Nitex nylon net with 80µm mesh or 153 micron standard net sizes, other sizes are available. The McNeil Core Sampler consists of a stainless steel cylinder that defines the portion of the streambed to be sampled and an attached basin that is used to store the collected sediments and trap the suspended fines. The sampler is worked into the channel substrate, and the encased sediment core is dug out by hand and deposited in a built-in basin. 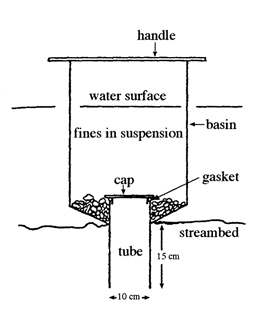 When all sediments have been removed to the level of the lip of the core tube, a cap is placed over the tube to prevent water and the collected sediments from escaping when the tube is lifted out of the water. The tube has a 4" diameter and is 8" long, and the basin has a 12" diameter and is 18" tall. This dredge is useful for sampling benthic communities inhabiting soft bottomed aquatic environments. As the dredge is lowered, the hinged upper doors swing open, allowing water to pass through and minimize the shock wave. When the dredge reaches the bottom, a messenger is sent down the line which trips the spring-loaded jaws. The jaws snap shut, preventing washout of the sample. The dredges are constructed of stainless steel with special Heliarc welding for extra strength and trouble-free life. A simple cable release system with convenient bar grip enables the operator to set the dredge with greater safety. Available 6"x6"x6" or 9"x9"x9", the Ekman Dredge comes complete with a stainless steel messenger 100 ft line and carrying case. 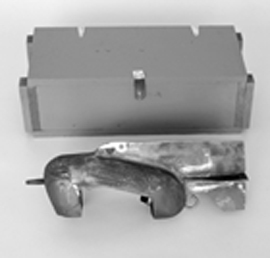 The proven design of the heavyweight grab sampler facilitates its use in all types of bottom substrates, except hard-packed clays. A simple pin mechanism prevents accidental closure of the dredge while in transit. The new improved spring-loaded release mechanism triggers the dredge upon impact with the bottom. The top of the dredge is covered with stainless steel screens to reduce the frontal shock wave and prevent the escape of the sample upon retrieval. The screens are removable to access the sediment sample without opening the jaws. The simplicity of its design and the rugged stainless steel jaw construction will ensure the dependability of the dredge for many years. Available 6"x6" or 9"x9", with powder painted weights and control arms or in an all stainless steel version. Depth integrating samplers are designed to continuously extract a sample as they are lowered from the water surface to the streambed and returned at a constant rate of travel. Ascending and descending speeds need not be the same, but the rate of travel must be constant in each direction. While the sample is collected, air in the container is compressed so that the pressure balances the hydrostatic pressure at the air exhaust and the inflow velocity is approximately equal to the stream velocity. All depth integrated samplers can be supplied with a special epoxy coating for chemical and trace metal sampling applications. 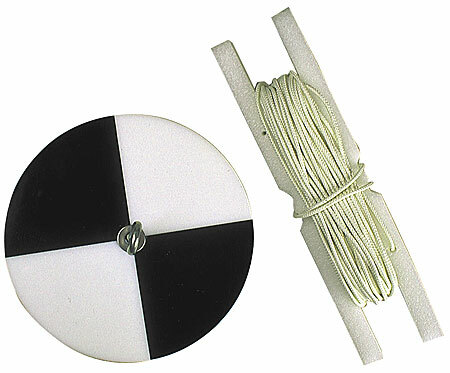 Secchi Discs are designed for the measurement of the relative turbidity and clarity of water. The 8" diameter disc is constructed of polycarbonate with a lead weight, and is finished in alternating black and white quadrants of acrylic paint. The disc is lowered into the water on a graduated line. The depth at which the disc is no longer visible is recorded. The disc is then raised, and a recording of the depth at which the disc reappears is made. The mean of these two recordings is considered to be the limit of visibility. Although the disc is unable to provide an actual measure of light penetration, it is useful in providing a rough index of visibility for comparative purposes. Whirl-Pak sample bags are made from blended virgin, low-density polyethylene, giving the bags two important characteristics; exceptionally clear film which is easy to see through, and superior strength. They can be used for taking samples of liquids, semi-solids, or solids. The film thickness varies from 2.25 mil (.057 mm) to 4 mil (.102 mm) depending on the size and style. 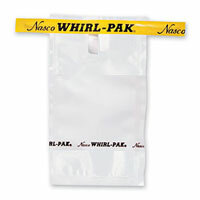 All Whirl-Pak bags feature puncture proof tabs that extends the tape on the tab past the wire ends eliminating the sharp points which could puncture the bags, scratch a person's hands, or puncture gloves. Whirl-Pak bags are sterilized with ethylene oxide gas by an independent, ISO certified sterilization company wghich saves valuable preparation time and eliminates concern about sample integrity. Whirl-Pak bags use only 10% or less space than other containers, saving valuable space in the lab, vehicle and warehouse, and significant savings on shipping costs, plus are easy disposed after use. By whirling or tightly folding the tab over three times, the Whirl-Pak bag becomes a leakproof container, which eliminates the loss of a valuable sample, and prevents impurities from entering the bag and contaminating the sample. This sampling device enables you to take accurate readings on settled solids in a variety of liquids, to any depth. Lower the Sludge Judge to the bottom of the tank. When the bottom has been reached and the pipe has filled to the surface level, tug slightly on the rope as the unit is raised. This sets the check valve, trapping the column of solids and liquid in the Sludge Judge. When the unit has been raised clear of the liquid, the amount of solids in the sample can be read using the one foot increments marked on the pipe sections. To release the material in the unit, touch the pin extending from the bottom section against a hard surface. This opens the check valve to drain the sample. The Sludge Judge is ideal for sewage treatment plants, chemical plants, food processing facilities anywhere that accurate samples of solids in non-caustic materials are needed. The unit holds approximately 3 oz. Per foot. The Sludge Judge comes in three 5 ft. sections of ¾" plastic pipe with screw type fittings. The top section includes a nylon line for raising the sampler. Convenient carrying case and cleaning brush are is available.